Toilets are one of the most important items in your house. You’re going to use your toilet every day for years, so get a good one! Whitehaus Collection®’s MagicFlush® line of eco-friendly toilets helps consumers turn their home green. Our toilets are designed to have a limited water usage per flush. With a 1.1/1.6 GPF (Gallons per Flush) option this allows for significant savings in water usage. An average family of 4 can save up to 10,000 gallons of water a year! Equipped with a siphonic-action, dual-flush system, the top mounted button on the WHMFL3351-EB toilet allows you choose either a full, or partial flush with one simple push. MagicFlush® eco-friendly, 1.6/1.1 GPF capacity, one piece toilet with a siphonic action dual-flush system, elongated bowl, and . The tasteful, streamlined one-piece design has an elongated bowl with a soft-drop seat for comfort. With a fully glazed drop way, our toilets are extremely sanitary, allowing for easy interior cleaning. Its stylish, smooth skirt allows for easy exterior cleaning. 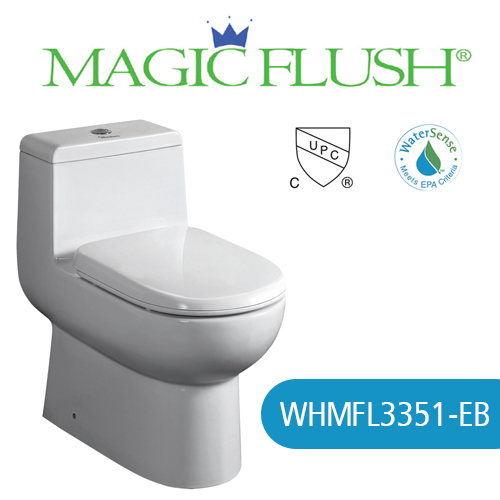 WaterSense certified and cUPC approved, this MagicFlush® toilet provides significant water savings without compromising performance, making the MagicFlush the perfect eco-friendly choice for any bathroom.